On 1920s-ish hardware on a same age door. 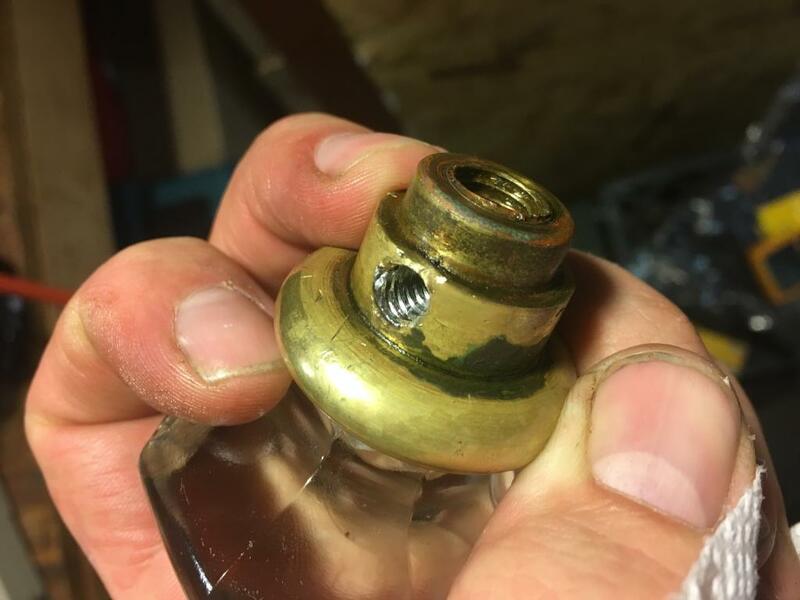 Knobs were loose, but set screw was stuck. Someone long ago already stripped the screw thread, so Ive tried to remove it. Kroil, ATF, etc don't help. I assume there's a combo of human oils, chemical bonding, etc. Going to break the extractor if I try any harder. Pardon my ignorance, isn't that what I did? I used a #2 extractor with a hole pre drilled. Used a slightly undersized hole so the extractor had more bite and less chance to bottom out. New set screw will be 1/4-20, are you implying to just drill and tap as is? 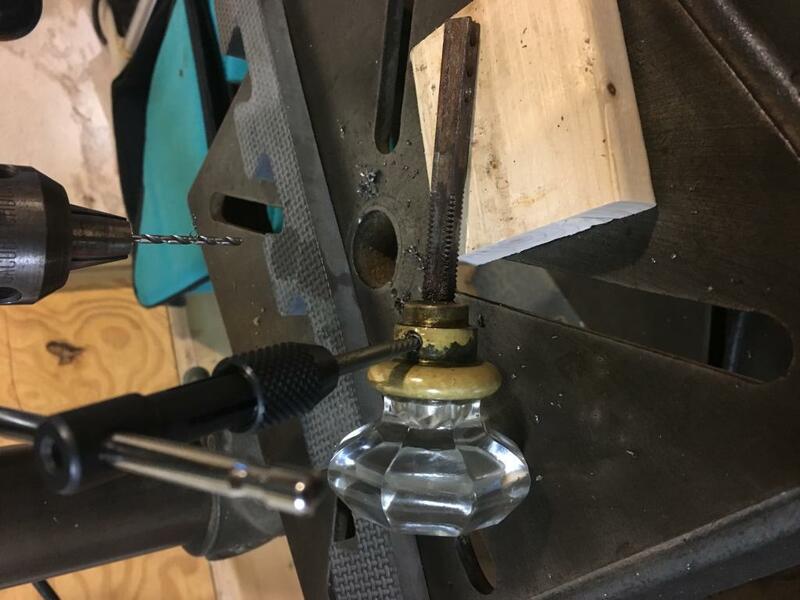 To answer your follow on question I think what Warstud was saying and what I'm suggesting is to drill the set screw in your drill press as you end already done for the tap drill size for the size of the set screw, then tap and use a new set screw. No need to go over size from original, just make new threads. That's the wrong kind of extractor. What those kind do is exert outward force on the fastener as you turn it to the left. Counterproductive is the word I use to describe those kind of extractors. I'd keep up-sizing the drills gradually. If you get lucky, the threads on the old set screw can be picked out like a spring. I've seen it done. Then clean up the threads on the door knob with a tap of the same size threads and you're good-to-go. That was a popular style door knob. We have the same ones in our house. Last edited by Rick in PA; 11/26/17 03:23 PM. Yup, observed that, though from one of the "seen on tv" types HD sells. Thought a more aggressive taper (get fatter in shorter distance) was good given that I can't get the rod out. 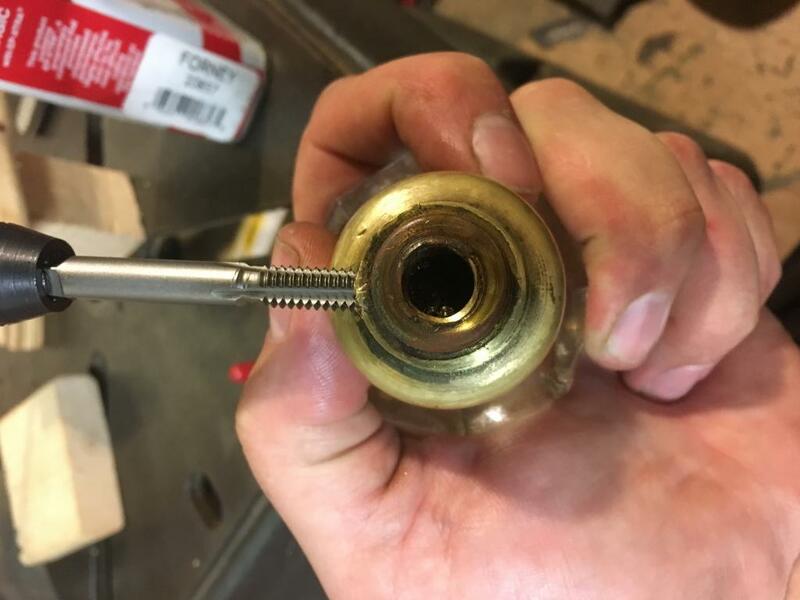 The brass gave easily as a result. So what is the better kind of extractor. For me and for this sort of a job I certainly don't mind paying good money upfront to have the right tool and do a proper job with minimal hang ups. I like DIY and on Sunday my time isn't money, but I don't care to waste my day if there's a better tool. I'd keep up-sizing the drills gradually. If you get lucky, the threads on the old set screw can be picked out like a spring. I've seen it done. Exactly - it just takes time, precision.... and a LOT of patience. It saves the original threads. Is there a name for those? Even snap on seems to be selling spiral/multi-spline types. Drilled out to #7 then tapped to 1/4-20. Success. It was crooked, not sure how I could do that better - I was a bit sensitive to clamping the handle in a vice. Nice work! I would not have clamped it in a vise either. Crooked won't matter for that, with the set screw in, you will never know.